Agile project management software includes Agile workflows, reporting and metrics, communication tools, and project assessments. We looked at the most popular options and rising stars and decided to review JIRA, Taiga, and Trello. 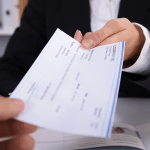 These companies covered the range of options for small businesses in terms of ease of use, features, and price. If your business doesn’t follow the Agile methodology specifically, we recommend a more general project management software solution. We recommend JIRA as the best Agile software for small businesses because it is the most comprehensive Agile solution on the market for a relatively minimal cost. We recommend JIRA as the best Agile project management software for small businesses because it is the most comprehensive option available. And while Taiga and Trello both offer excellent free options, JIRA’s $10/month price for up to ten users is so low that it may as well be free as well. JIRA is best known for its pedigree as a bug tracking system, but it has grown to support many project management features, particularly within the Agile methodology. 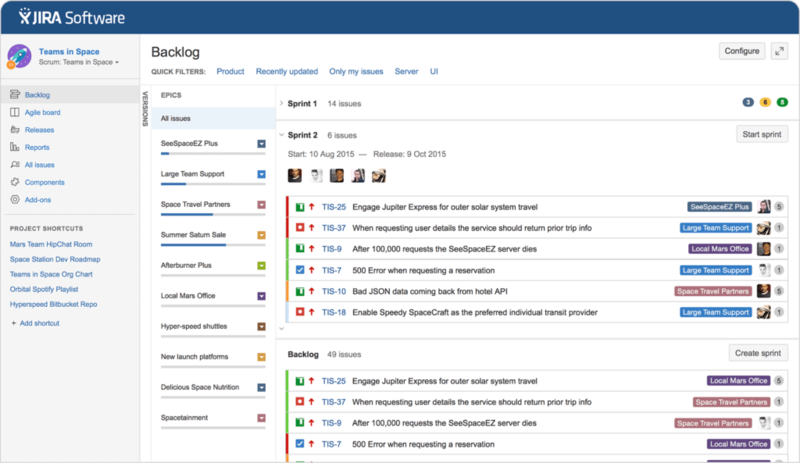 Similar to Taiga, and in contrast to Trello, JIRA can be implemented to support the processes and workflows of either Scrum or Agile frameworks as needed — or a hybrid of both. 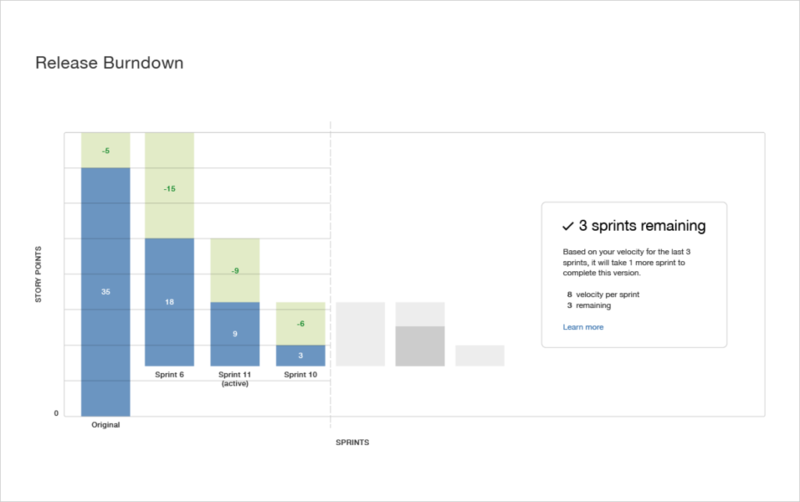 Designed to help users capture, assign, and set priorities to your projects, JIRA includes a full range of Agile features including burndown charts, sprints, velocity metrics, and more. Its functionality also consists of the key components that apply to your business’ choice of either Scrum, Kanban, or hybrid implementations: planning, estimating, prioritizing, executing, and evolving. 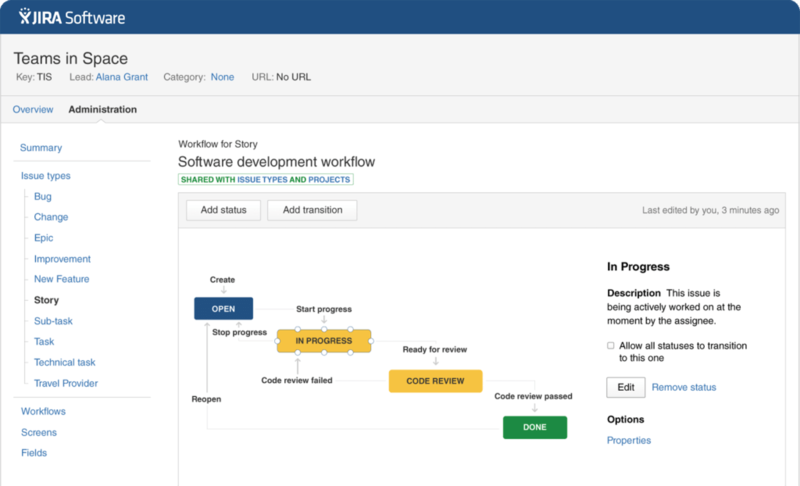 JIRA’s customizable workflows help you to easily create the process that fits your business, whether within the Kanban or Scrum framework. 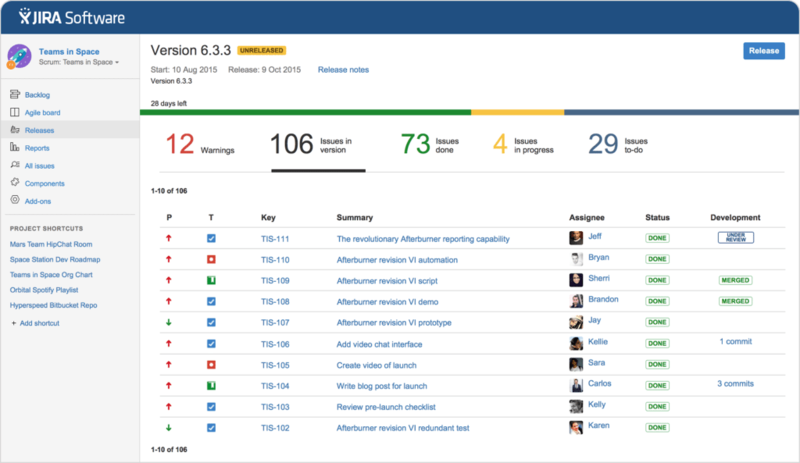 It’s robust, flexible, and intuitive to use and the range of products available from Atlassian ensure that JIRA is scalable across your business as it grows. For example, JIRA Core has opened JIRA up to other operational areas, such as marketing, ops, and HR, making JIRA a viable comprehensive solution for your entire business. However, JIRA’s main strength — its comprehensiveness and flexibility — is also its main weakness. The range of options available to users can be overwhelming initially, especially to non-project managers, making the learning curve to maximizing JIRA’s usefulness relatively steep. Taiga and Trello offer friendlier user experiences and are easier to learn, especially Trello, albeit at the cost of many of JIRA’s features. JIRA is also the only software of the three without a free package, although it does offer a 30-day free trial. We recommend Taiga as the best open source Agile project management software. Taiga is an award winning agile project management tool that delivers all of the features you need to execute your team’s projects within the Scrum or Kanban framework and none of the extras that you don’t. This helps to keep teams focused and ensures that the software augments your process rather than weigh it down. Taiga’s functionality is focused on the basic elements of the Scrum and Kanban frameworks, such as project backlogs, sprints, epics, stories, and the management and reporting tools needed to facilitate them. Teams can select either or both frameworks for their project, launch a new project with that framework’s templates, and adapt and iterate them as they progress through the work. Because of its open source pedigree, Taiga is also constantly evolving; the user community contributes to improvements and enhancements, and teams can collaborate within themselves using wikis or in the larger Taiga community if their projects are made public. Neither JIRA nor Trello offer similar collaboration features. Taiga’s shortcomings are in its reporting and third-party application integrations. Both areas fall short of JIRA and Trello, particularly JIRA’s reporting and Trello’s supported integrations. However, both of these are known within the Taiga community, and developers are continually improving on them — particularly the integrations thanks to Taiga’s open API. We recommend Trello as the best Agile project management software for non-project managers because it’s simple, easy to use, and best of all — free. 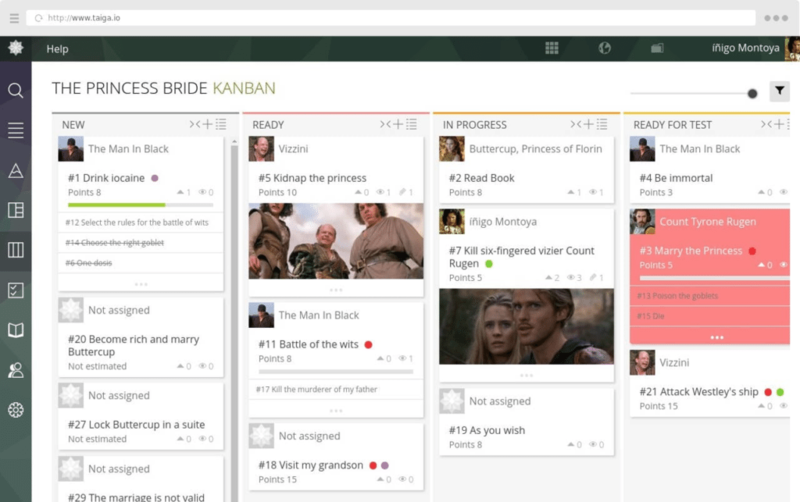 Trello simplifies the project management process by making it highly visual. 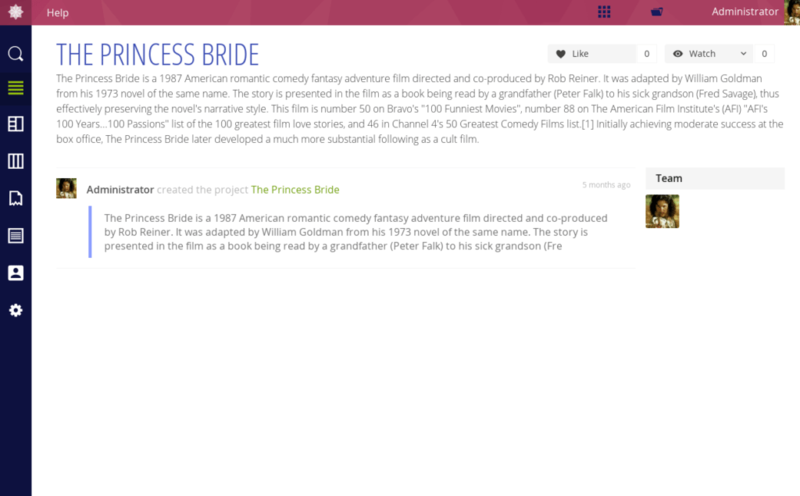 Users create boards for their projects and cards for the individual tasks that make up that project. Within each card are the details of that task, such as descriptions, due dates, time estimates, assignees, and any associated documents or files can be attached. Cards are then organized in lists or columns with a simple drag and drop interface that allows users to move them through the workflow that they define. This format will be immediately familiar to anyone who has worked within the Kanban framework, which is what also makes Trello an Agile project management software solution. For example, project workflows can be defined in terms of the project backlog, to do, in progress, in testing, and done lists. In addition to non-project managers, Trello is a good option for smaller teams, teams focused on continual product releases, and those who like a visual display for their projects. And in many of these cases, the free package will likely be sufficient to meet your team’s needs, making it an economical solution as well. Adding some of these features (burndown charts, for example) is possible through third-party application integrations like Scrum for Trello, but they’re not available natively within the software. All three of the software we reviewed are very inexpensive for the value that they add to your business. In fact, both Taiga and Trello offer free versions that are either fully featured or very close to it; and while JIRA isn’t free, the cost is relatively minimal. JIRA offers a straightforward pricing model with two packages available, depending on the number of users on your team. Both pricing packages are fully featured. You can add users as needed and your pricing package will automatically adjust accordingly. Taiga offers a fully-featured version of their software that’s completely free to use — if your business is comfortable with all of their projects being available for public view. While this might not seem desirable on the surface, it builds on the open source philosophy of the software and encourages input and support for your projects from the software’s user community. If you would prefer that your projects remain private, Taiga also offers three affordable paid plans. Trello offers two pricing packages that are suitable for small businesses, Free and Business Class. The Free package includes unlimited boards, lists, cards, members, checklists, and attachments and limits users to one integration per board and up to 10MB of file attachments. The Business Class package at $9.99/user per month includes unlimited integrations, up to 250MB of attachments, and adds the ability to add restricted user accounts (handy for client access) and priority support with a one-day guarantee on email replies during business hours. The one significant downside to JIRA is that it’s not the easiest software to use. The range of options and features that make it such a comprehensive and valuable agile project management tool also give it a steep learning curve and can be overwhelming for non-project managers or developers who are used to it as a bug tracker to use. In fact, a Google image search for “jira memes” returns an endless number of results. JIRA does make efforts to mitigate this, though. Their online knowledge base is extensive and includes complete user documentation, developer resources, and Atlassian University that offers self-paced training for individuals and teams and even certification programs. As well, a good understanding of the Agile methodology and the Scrum and Kanban frameworks will go a long way in helping you make the most of JIRA. Knowing the terminology, how different elements relate to each other (epics and stories, for example), and the general workflow process that you can either adopt wholesale or adapt to your needs will make using JIRA more friendly and intuitive. By stripping away many extra features and focusing solely on Agile project management and team collaboration, Taiga strikes a balance between JIRA’s comprehensive functionality but difficult usability and Trello’s basic functionality but famous ease of use. This is also wrapped in a modern and thoughtful design, which helps to enhance the user experience. Taiga was initially developed as an internal solution to managing projects before it was released for wider use. It was built to be simple and easy to use and to leverage its community of users for ongoing improvements and enhancements in the open source philosophy. When you create a project, Taiga asks if you want to use a Scrum or Kanban template. 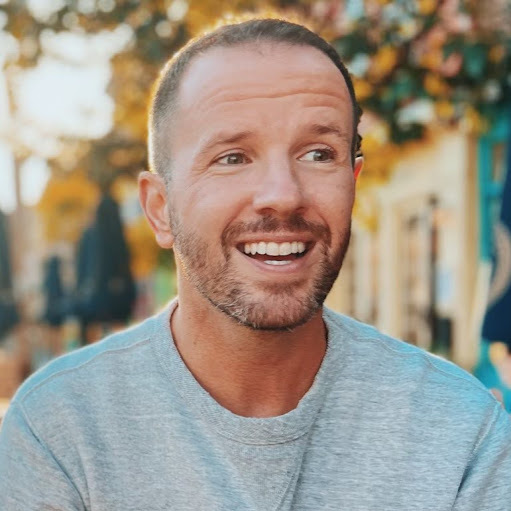 If you’re not sure, or if you want to create a hybrid framework that aligns with your business’ workflow, then you can select both. And true to the Agile methodology, you can edit, update, and iterate the template as you work through the project and learn from your progress. Trello’s ease of use, especially for non-project managers, is its greatest strength. The layout is simple and easy to navigate, projects and their tasks are represented visually, and its drag and drop interface is intuitive and easy to learn. A central dashboard displays all of your boards (projects), which are opened with a click. Once you’re viewing a board, all of your cards (tasks) are organized neatly in columns of lists, which gives a high-level overview of your project. Cards can then be moved from one list to another by dragging and dropping them as needed. Initial setup is a breeze, too. One click creates a new board and another creates a card, which is the foundation for every project and its tasks. Progress visualization. Transparency is integral to the Agile methodology and being able to visualize a project’s progress and where each team member is in their work helps keep projects on track. Issue tracking. Along with progress visualization, this helps the team to easily identify any issues that require immediate attention. Collaboration. An effective Agile project management tool will encourage team members to work together, share resources, and centralize information. Estimation. This helps the project manager to efficiently assign the resources needed to complete the project and to keep their work on time and on budget as it progresses. Client access. Client visibility is important in the Agile process and giving your clients access to their projects, even limited, can help with walkthroughs and prioritizing tasks. How each software executes these high-level features is what differentiates them from each other. 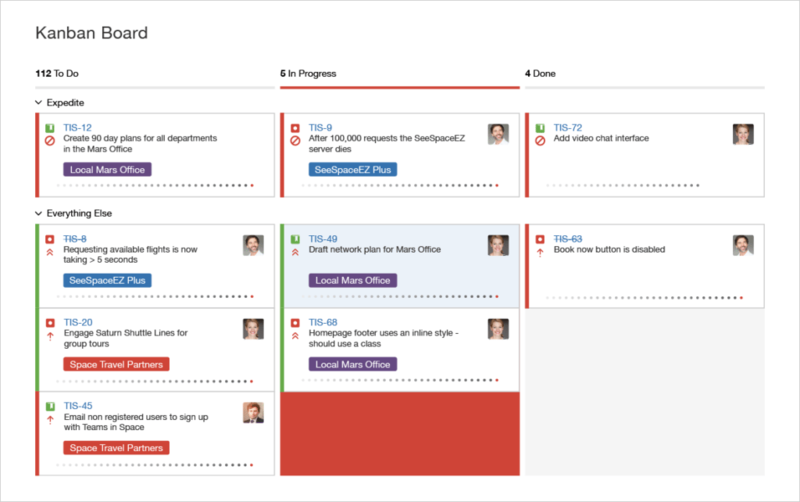 JIRA includes features that help your business manage its projects in the Agile framework that you prefer — Scrum, Kanban, or a hybrid of your own design. From boards to reports, JIRA is the one agile project management tool you need to plan, track, and manage your projects. If your business prefers the Scrum framework with its fixed-length iterations of sprints, JIRA is equipped with the tools you need to help bring it structure — sprint planning, daily scrums (or stand-up meetings), the sprints themselves, and post-sprint retrospectives. Sprint planning meetings are where the tasks, or stories, in your sprint backlog are allocated to your team members. JIRA makes it easy to groom your backlog, estimate how long the stories will take to complete, adjust any scope as needed, check-in on your project’s velocity, and re-prioritize any stories or issues accordingly. During the sprint, teams will have a brief stand-up meeting every morning known as a daily scrum. This is where each team member shares what they completed the day before, what they’re working on that day, and if there are any impediments to their progress that the Scrum Master can help mitigate. JIRA’s custom dashboards give you quick and easy visibility into the work in progress, helping you to prepare for these daily meetings. Finally, JIRA also has a number of reports that are specific to Scrum for your post-sprint retrospectives. For example, burndown and velocity charts give you the data you need to refine your estimating and planning process for subsequent sprints. And like Agile in general, you can continually iterate and refine your workflow as you progress through your project and learn from previous work. Or if you’re like one of the many teams that adapts Scrum and Kanban frameworks to create a hybrid that works for your team, JIRA can support this as well. You can combine features from both, such as sprints and roles from Scrum and boards and WIP limits from Kanban. Taiga delivers much of the flexibility of JIRA, but with more focus. Where one of JIRA’s strengths lies in the range of options and features it includes, this can also be a detriment to its ease of use. 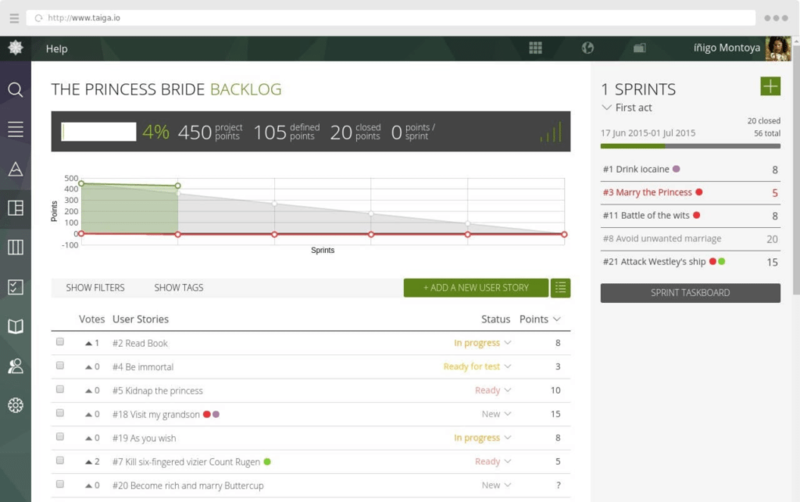 Taiga, however, is an Agile project management tool and nothing more — in a good way. Taiga lets teams manage and monitor a list of issues and concerns as stories, classify them, and assign them to the proper resources to complete them in sprints. Once sprints are in progress, their stories can be tracked, resources can log the time they spend on them, and the project manager can generate reports on their progress. Where Taiga differs from both JIRA and Trello is that they also offer a social component to the software. An example of this is the wiki feature that’s built into Taiga. Team members can post project documentation, contribute to its progress, edit it, and attach files and images to help keep the rest of the team better informed. Taiga also adds private, group, and video chat functionality by integrating HipChat. As well, because Taiga is an open source project, this spirit it baked into the usability of the software — not just its development. 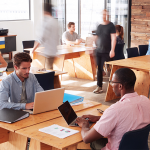 Projects can be set as public so that anyone outside of your business can contribute to it. For developers in particular, this is a great way to crowdsource the growth of a project. Taiga even has a sense of humor. If any of your team members feel in over their head, they can use “Locaine’ — the fictional poison from the movie The Princess Bride as a sort of white flag to wave to let the rest of the team know they need help. 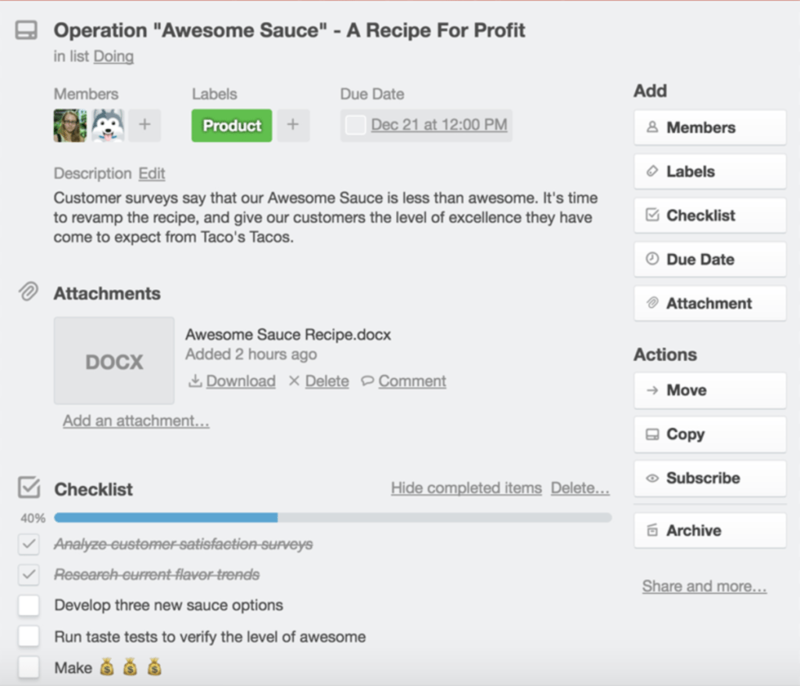 Trello’s best feature is how easy it is to use, especially for non-project managers. The visual design and drag and drop interface lets you organize your projects based on your team’s established workflows, or create new ones using its Kanban format. Updating cards (tasks) is quick and easy and the high-level information you need to assess the health of your projects is available at a glance. 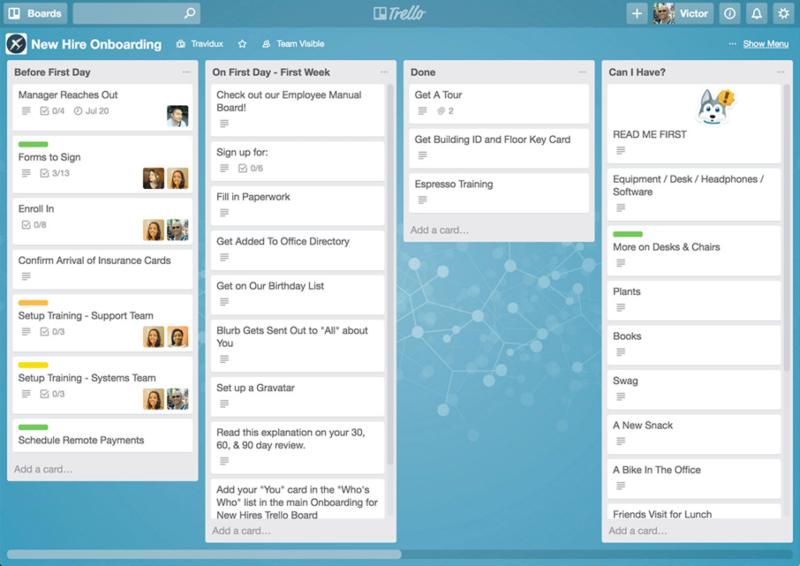 Trello organizes information on a board, each board contains multiple lists, and each list contains multiple cards. Boards represent projects, lists represent your workflow, and cards represent tasks and all are fully customizable according to your needs. Cards can include a description, document and file attachments, checklists, due dates and times, and be assigned to any team member. They can then be dragged and dropped between lists as their organization, assignment, or status changes. This Kanban-like format is easy for non-project managers to understand, but immediately familiar to more seasoned Agile teams. In fact, you can easily imagine Trello as a web-based replacement for a physical task wall of Post-It notes in your office. Upgrading to a paid subscription allows you to create restricted user accounts, which are useful for granting limited access to your projects to the product owners at your clients. However, Trello doesn’t extend much beyond task management and falls short of JIRA and Taiga as a more comprehensive end-to-end Agile project management solution. For more technical challenges, JIRA also provides access to phone and email support. Taiga: Because Taiga is an open source software, its customer support is largely user-based with discussion forums and an active community of developers who continually improve the software, particularly with add-ons and integrations. In addition, there is an online knowledge base and Taiga offers email support with a typical one-day response time. Trello: Trello’s customer support relies heavily on their comprehensive online knowledge base and user documentation. Priority email support with a guaranteed one-day response time is also offered, but only with Trello’s paid package. Agile project management is a specific methodology that benefits from a software tool that has been built with its principles in mind. JIRA, Taiga, and Trello all offer their own range of features and usability — from JIRA at the high-end of complexity to Trello at the more simple. Because of this, each software presents its own use case depending on your business’ needs. That said, JIRA offers the widest range of features, the most comprehensive functionality, and is the most customizable. This comes at the expense of some usability, but we believe that the benefits far outweigh the learning curve. And at $10/month for up to ten users, it delivers exceptional value to your business. For these reasons, JIRA is our recommendation for the best Agile project management software for your small business. Really excellent set of reviews there, Gavin. Thank you. I would like to add one that I use (I’ve used Trello a bit too and it’s good). I do some creative work — Facebook advertising, Events and website, graphics etc — for a nun who is based in Sri Lanka. I’m in Australia. We use Glip which is also free for us and we combine it with Skype calls where we can share our screens. Glip uses Google’s app for this but that would switch us into the paid version. Glip is really impressive with no limitations other than the huge raft of integrated third-party applications that we have not had any need of yet. There are no limitations on the number of people who can work together on the platform. They offer chat, file uploads and storage, version management, calendars etc and we find it fantastic for working remotely. Worth having a look. Thanks for sharing your experience with Glip with us. I haven’t used it personally, but will definitely consider it for future updates of the guide. It sounds like a strong option.